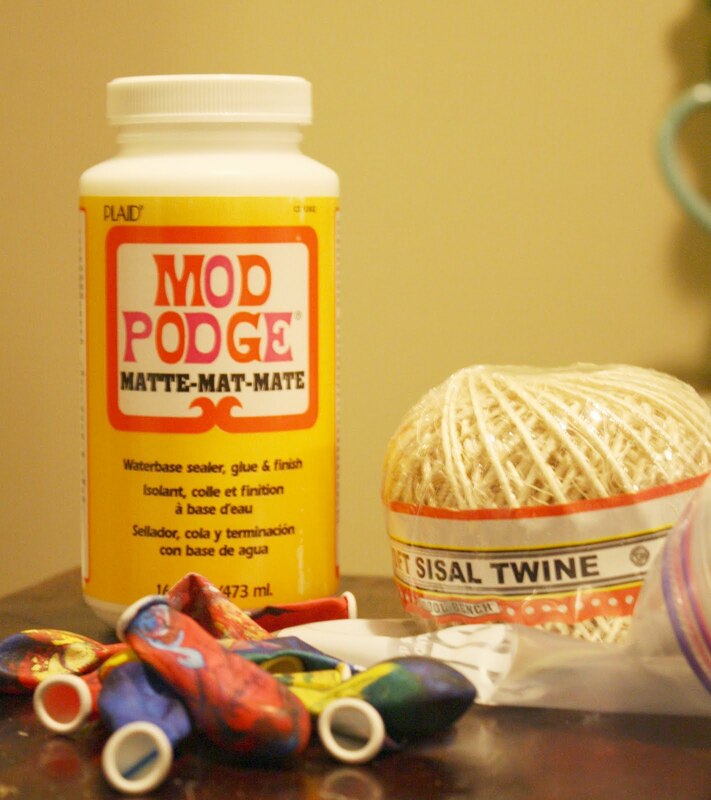 My name is Rachel and I have been crafting since I could tie my shoes. If something can be made better, more beautiful, or just new I will do it. I have a knack for decorating, sewing, baking and creating gifts. I like to share my savvy skills so others can learn from what I have discovered. I love your ideas and comments they're what make this blog what it is!!! Please feel free to share my ideas and tutorials. Please do not copy text from my blog without permission. I encourage you to use any ideas from my blog, I just ask you to please link back to bayberry creek Crafter. Please do not sale any patterns, tutorials or any items made from them. Thank you. 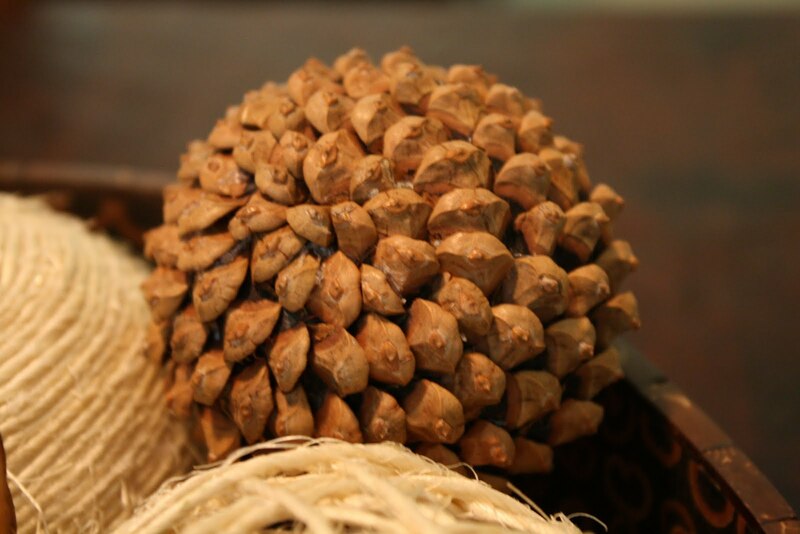 Inspiration for this project came from all the hundreds of pine cones lining the parking lot of my complex. I was trying to think of a way to use them and also needed something to put on my new 3 teared stand. I also decided to put them in this bowl that sits on my kitchen table. You will start off by cutting the pieces off the pine cone. I cut the top off first to make it easier. 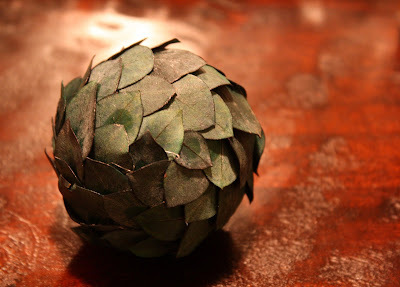 I used about 5 pine cones to get all that I needed to cover one ball. 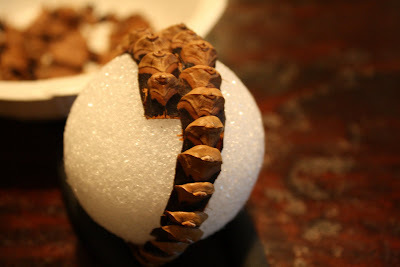 I didn't use all the pieces off the pine cone. The ones at the bottom are difficult to get off. 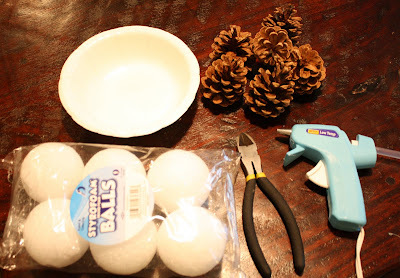 Start gluing them in the center of the ball. Before you start it may be good to mark a straight line. I just eye balled it though. Glue each piece on top of the previous. from the first row using the same method. Toward the end it is more like a puzzle. Before gluing place the piece to see if it is the right size and length. Use smaller pieces at the top. 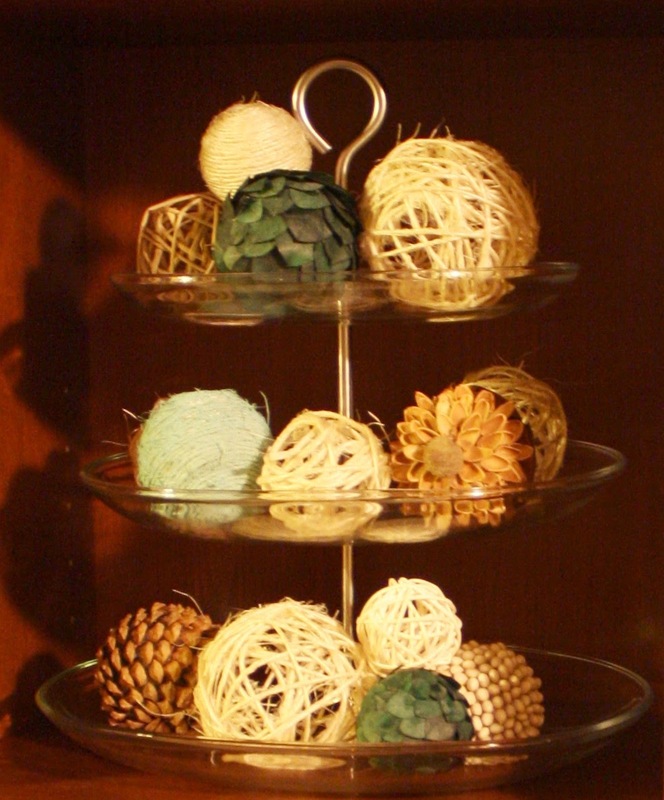 And there is your Decorative Pine Cone Ball! 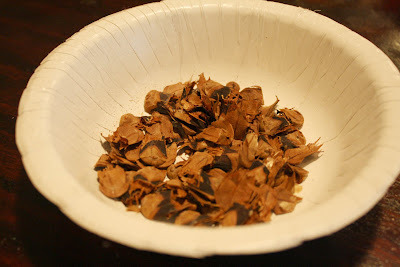 You will need to either cut of the leaves or I just pulled them off using my nails. You don't need a lot for one ball. 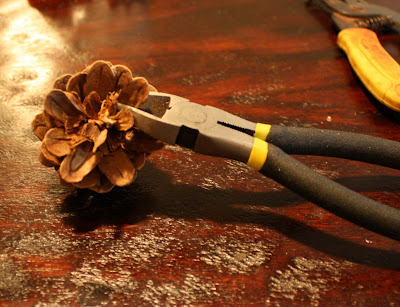 Use the same concept as the pine cones. Start placing the leaves in the middle of the ball and then on top of one another. Continue in circles up to the top again using smaller leaves at the top is best. Start by blowing up your balloons to the desired size. 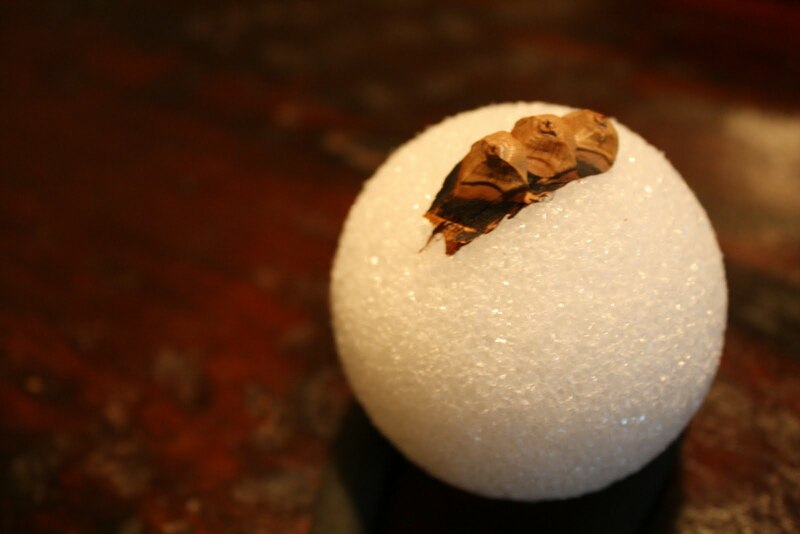 While doing so try and make sure they are as round as possible and not oval. 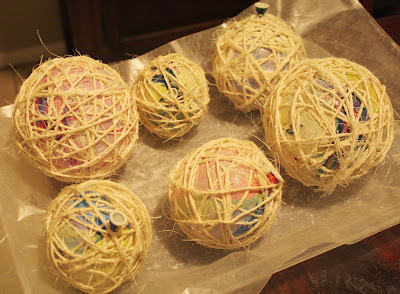 Wrap the twine around each ball to measure how much you want, this way you don't end up with too little or too much. After you have done that wrap that twine around your hand. 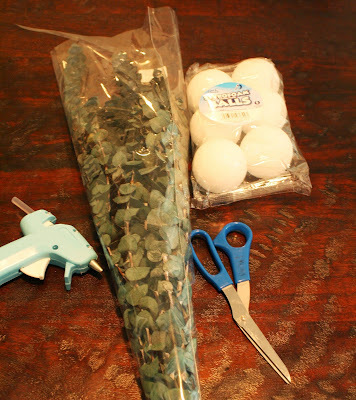 Make sure you do this or when you take it out of the Modge Podge it will make a mess when you start to wrap it around the balloon again. 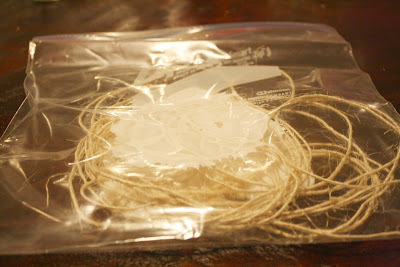 Now pour some Modge Podge in the plastic bag and then add your twine. Move it around in the bag to make sure it gets coated. Take it out of the bag and begin to wrap it around the balloon. 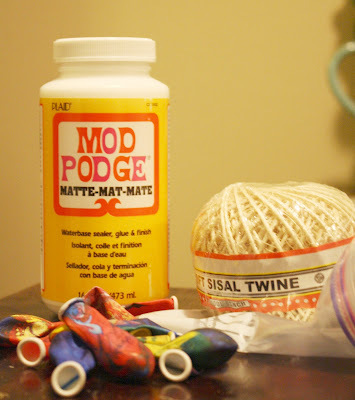 Avoid getting a lot of twine in one place. When you get to the end of the twine tuck it under the other pieces. Now lay them out to dry. I left mine over night. 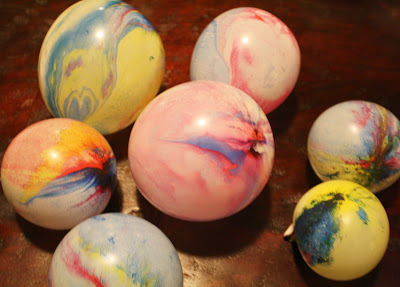 When they have hardened hold the tied part of the balloon and pop it some where else with something sharp. After it deflates pull it out. There may be some dried Modge Podge in the holes of the ball it come of easily if you blow it off. There they are. You can do a lot with these fun DIY projects. I also made some that I found from other bloggers. One using twine and a stryrofoam ball from V and Co. and the other using beans and a styrofoam ball from Creek Bed Threads. Where could you use these Decorative Balls in your home? SO cute!! And these things are so expensive she in the store!! Way to go! Oh Me! 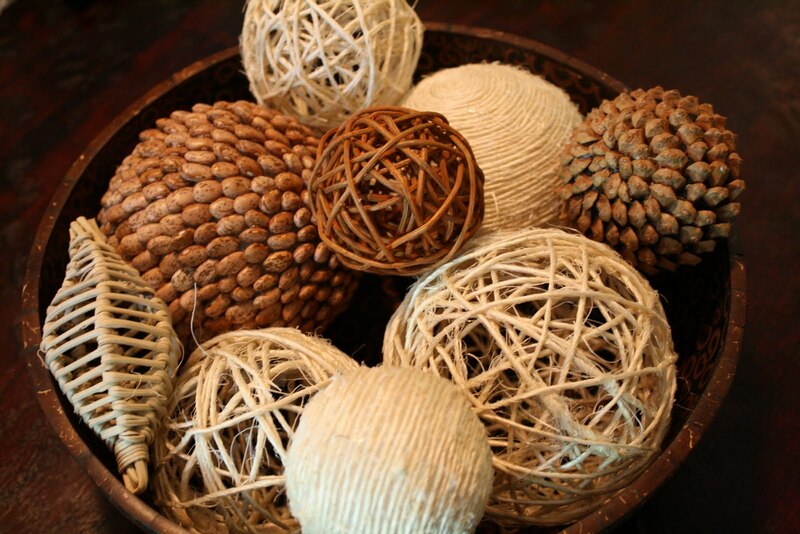 Your Decorative Balls are beautiful and so cleverly created. 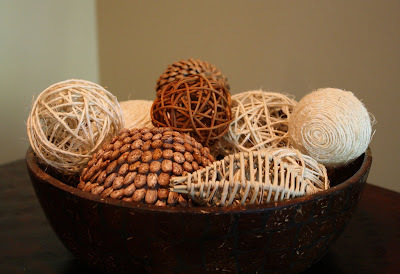 This post showed up on my Squidoo lens about Decorative Balls via Google Blog Search and I am so glad it did. I hope some of my readers will make their way here. I sure enjoyed my visit. Thank you. I absolutely love these. Everytime I see them in stores I cheap out because I can't justify spending money on them. Now I will just have to make some myself! Thanks. Wow, that´s fantastic! It´s so personal to make these things on your own. Thank you for the inspiration. So much taste. Thank you ! !